In summer, Venice's Lido is a popular Adriatic beach resort, but it's a convenient (and inexpensive) place to stay at any time of year. 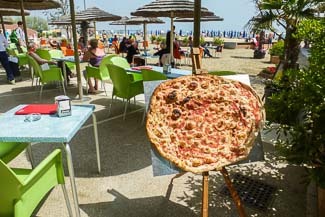 ABOVE: On a warm Saturday in May, tourists and locals enjoy pizza on the Lido di Venezia's public beach. The Lido di Venezia--or simply the "Lido," in local parlance--is a barrier island that separates the Venetian Lagoon from the Adriatic Sea. By vaporetto or public water bus, it's only a few minutes from Venice's historic center, which makes it popular as a dormitory suburb of Venice and a summer resort for tourists. In the warmer months (say, from mid-May to mid-October), you may prefer the resort ambiance of the Lido to the more crowded urban landscape of Venice's city center--especially if you're traveling with children who might appreciate a villa hotel with a large garden or a day at the beach. In this 13-page guide, we'll cover the Lido's high points and offer advice on topics such as hotels, transportation, and what to do during your stay. To get started, go to page 2, where we'll give you an overview of the Lido di Venezia and its location in the Venetian Lagoon.